Craving the deep fried goodness of chicken wings. 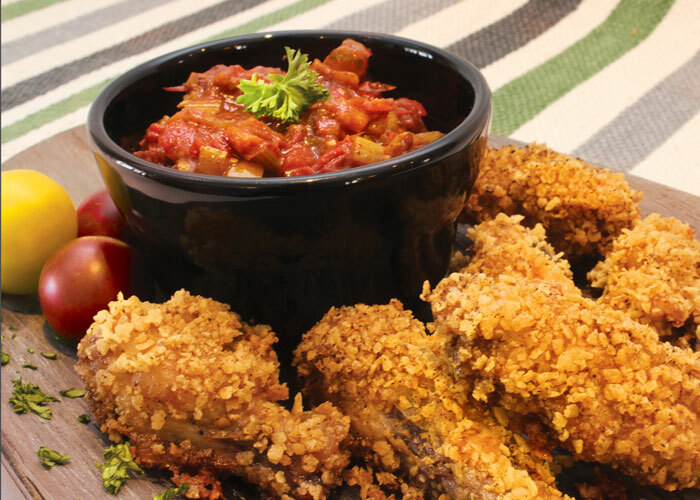 We've got you covered with these spicy Mexican Chile Chicken Wings. To grind the corn chips, place them in a food processor and process to a powder. Place in a bowl. Add the chili powder, oregano, cumin, sea salt, and pepper to the corn chip mixture and mix. Place the oil and garlic in another bowl. Dredge each chicken wing in the oil. Roll in the corn chip mixture. Place each wing on a baking sheet. Bake for 40 to 45 minutes or until the chicken is cooked. Remove from the oven and place on a serving tray. Serve with Chili Sauce. Heat the olive oil in a small saucepan. Add the onions and lightly sauté until onions are slightly translucent. Add the tomatoes, peppers, celery, chili powder, garlic, mustard, ginger, cayenne, sugar, apple cider vinegar, cinnamon, and cloves. Bring to a boil and lower to simmer. Cook until the vegetables are soft. Transfer to an airtight container if not using immediately. The sauce will keep for one week in the refrigerator. Spicy tuna salad and sweet cherry tomatoes are a protein-packed party appetizer or anytime snack! Tomatoes have the best flavor when stored at room temperature, so be sure to chill the tuna in a refrigerator-safe container before assembling. Pulled Pork Sliders with Tomato Chutney are the ultimate crowd-pleaser. Tender, flavorful pulled pork, fresh tomatoes and a homemade sweet and spicy barbecue sauce combine to make a sandwich that will have guests raving for more. Eggplant never looked so good, and neither has our grill. This recipe is a flavor explosion of all your favorite vegetables grilled to perfection all year long!